Like our windows, our French doors are available with different High-Performance™ Low-E® glass packages. While all meet ENERGY STAR® requirements, each option has unique features. Our standard variant delivers a healthy trade-off among thermal insulation, solar heat reflectivity, ultraviolet (UV) protection and daylighting. Our SmartSun™ glass might not admit as much sunlight, but it insulates better and blocks more solar radiation. Our Sun glass reflects the sun’s infrared light the most. As with our sliding patio doors, our hinged doors come with numerous configuration options. You can have just one panel to accommodate the size of a single opening that swings either inward or outward. If you have a wider opening, you can have two operating units. Out of all Renewal by Andersen of St. Louis’s door options, the Frenchwood hinged patio door system has the broadest selection of exterior and interior colors. It’s available in four solid colors as well as three, real-wood interior options you can stain to complement your existing decor. Our patio doors are also available in a bevy of handle styles. The best part is that you can choose different pieces for the inside and the outside of your unit. The only thing that has to match is your door hardware and your taste. Most of our handle styles are available in various Estate Collection™ hardware finishes. Our brass, chrome and nickel finishes boast a special coating that seals the finish, protecting it against tarnish and corrosion. Our bronze options feature a “living patina,” which changes its character with time and use. We’re only scratching the surface of our patio door customization options. 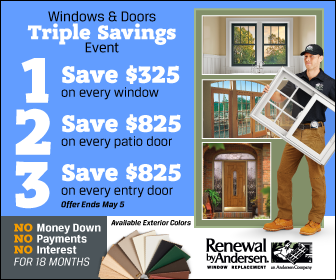 Call Renewal by Andersen of St. Louis at (314) 332-2364 to schedule your consultation to design your replacement doors and get a FREE estimate. We serve St. Louis, MO, and the neighboring communities.